pretty picture composition! can you make this for me, but add pineapple = pina colada?! : P then, put a scoop into some soda water with rum = pina colada icecream float?! Yum, I too love coconut. Will have to try this soon. I’ve been making ice cream lately too, my latest being rhubarb crumble, but coconut I have to try. I checked out your rhubarb crumble and I”m so intrigued!!! YUM! this looks awesome, we’ll have to try it! yum! love it! just got an ice cream maker this year and looking for some fun recipes! definitely will have to give this a try, especially since my mom also loves coconut ice cream, this will certainly be a nice treat for her! Another fantastic food photographer. I have much to learn. And, very nice recipe by the way. 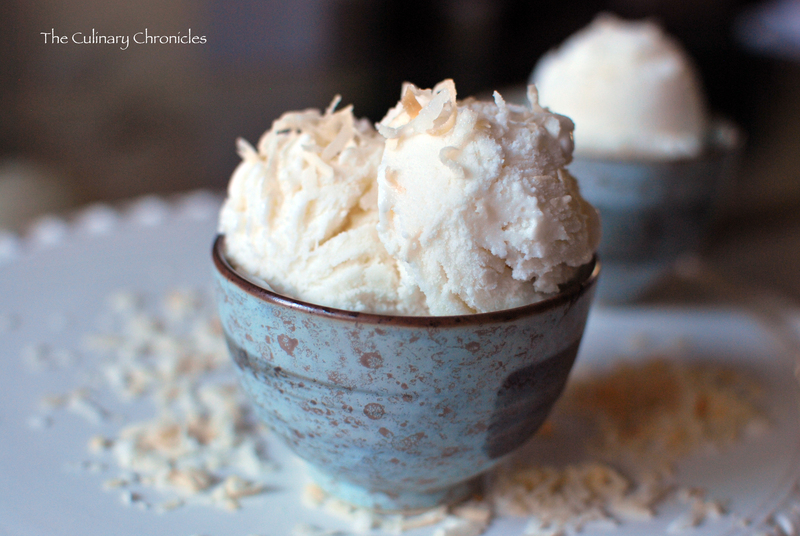 I’ve busted my ice cream maker out countless times this year but I have yet to make anything with coconut. Yum. Ooh, this looks really good. I love coconut desserts too. Definitely on my to do list of ice cream recipes. This looks amazing! I am soooo trying this! I made this last night..OMG!! My family loved it. i am going to tastykitchen and giving it a 5 mitten. Thanks for the recipe!